The annual concert, now in its 84th year, will feature the usual ‘greatest hits’ of the classical era, and some new pieces. 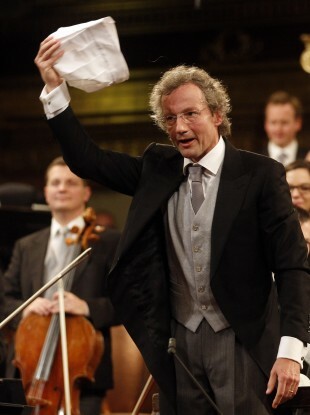 Austrian maestro Franz Welser-Moest conducts the Vienna Philharmonic Orchestra with a cap during a rehearsal for the traditional New Year's concert. WAGNER, VERDI and a myriad waltzes will broadcast live to 81 countries when the Vienna Philharmonic kicks off 2013 with its traditional New Year’s Concert today. The event – sold out over a year in advance and followed by millions around the world – will once again be conducted by Franz Welser-Moest, musical director at the Vienna Opera, after his first appearance in 2011. Together with the orchestra, Welser-Moest has devised a programme full of novelties: 11 of the 16 pieces performed at the Musikverein’s grand Golden Hall will be playing at the New Year’s Concert for the first time. Among them are tributes to German composer Richard Wagner and Italian Giuseppe Verdi, both of whom would celebrate their 200th birthdays in 2013. Wagner’s dramatic Prelude to Act Three of Lohengrin and ballet music from Verdi’s opera Don Carlo will however alternate with the Strauss dynasty polkas and waltzes that are most associated with this classical event. “It should be a voyage of discovery,” Welser-Moest told AFP ahead of the concert, describing it as “a very subtle programme,” with a heavy accent on the less frequently played Josef Strauss. A tradition going back to 1939, the concert draws crowds of tourists every year, clapping gaily in time with the Radetzky March – a beloved and unavoidable encore, alongside the melancholic Blue Danube Waltz. The New Year’s Concert – a recording hit with CDs and DVDs always released within weeks – will be broadcast live on TV in Ireland and 80 other countries, which host broadcaster ORF says is more than ever before. The New Year’s Concert will be broadcast on RTÉ One at 10:15am. Email “New Years Day kicks off with traditional Vienna concert”. Feedback on “New Years Day kicks off with traditional Vienna concert”.